Long ago and far away, I was the proud owner of a pair of dipole loudspeakers, and when everything was just right, they were the most incredible speakers Id ever owned. But they required a tremendous amount of time and effort to set up properly, and over the years I developed a love/hate relationship with them. Every time I moved, or rearranged furniture, which I did a lot in those days, I would then have to spend weeks getting the speakers dialed-in and the sound perfect. In some rooms, they never did sound right, but when everything came together, nothing else Id heard could compare with their openness, width, and depth of soundstage. Ive long since traded those speakers away, and have missed that particular sound ever since. It was with this in mind that I took delivery of a pair of Mirage OMNI 50s, one of the newest in Mirages new OMNI speaker line. The $400 USD OMNI 50 isnt a dipole (which produces sound out of phase from the enclosures front and rear), but instead uses what Mirage calls Omnipolar technology. The OMNI 50 produces a controlled in-phase dispersion pattern of 360 degrees, biased to produce slightly more sound toward the front. Although this design differs technically from my old dipoles, its goal is the same: to produce the wide, open soundstage Ive sorely missed these last several years. Would the OMNI 50s meet my admittedly high expectations for soundstage development? Would they be as much of a pain to set up as my old dipoles? Would I have to sit dead center, between the speakers, to get that sound I love so much? At $400/pair, the OMNI 50 costs $100 less than the original UFO-shaped OMNISAT, and comes in a more conventional-looking enclosure. As it turns out, the OMNI is anything but conventional, having as it does the OMNISATs top-mounted tweeter-in-a-pod and angled-woofer design. In an effort to drive the cost of Omnipolar technology down into the budget category, Mirage came up with the clever idea of using a single woofer and a skyward-pointing tweeter, with a waveguide (Mirage calls it an OmniGuide) above each to control directivity in a 360-degree pattern around the speaker. Its a clever idea, though I shudder to think how many calculations had to be performed to optimize the shape of the OmniGuide alone. As I said, the OMNI 50 looks almost conventional. The only indication of something unusual is the grille, which covers the front and extends over the top, above the drivers, in a slight barrel-shaped vault. Only when I removed the grille did I realize I was looking at something new and different. The steeply raked angle of the woofer baffle, with its egg-shaped OmniGuide suspended above, begged for attention. A closer look revealed that the tweeter points straight up from inside this appendage, its own saucer-shaped OmniGuide hovering just above it. Theres a large port on the front of the box to enhance bass extension, and a single pair of heavy-duty five-way binding posts on the back. The posts are spaced too wide for double banana plugs, but theyre significantly heavier than the average speaker terminals found at this price range and are unusually easy to tighten. The side edges of the sloped woofer baffle are accented in gray, as is the port. My review samples were finished in a basic black-vinyl wood-look laminate. The overall look is quite attractive, though Im not sure I like the look of the gray port with the grilles removed. If youre looking to buy any kind of dipole, bipole, or Omnipolar speaker, be forewarned that you wont typically get the best sound out of any of these designs by placing them wherever your old speakers happened to be -- the performance of any such speaker will depend far more on its interactions with your room. The good news is that I found the OMNIs much more forgiving of placement than my old dipoles, but I did still have to work at the setup a bit more than Im used to in order to get the correct balance. I used the OMNI 50s with an Onkyo TX-S696 surround receiver and a Sony DVP-NS755V DVD player. The spacious sound of the Omnipolar technology was apparent on nearly every track of the SACD reissue of Pink Floyds Dark Side of the Moon [Capitol CDP 5 82136 2]. This was most obviously evident on "Time" and "Money," where the soundstage extended to the edges of the room. It was also apparent on such lesser-known tracks as "Any Colour You Like" and "Breathe." You might think Im discussing the performance of a multichannel system, but I was listening to the two-channel CD layer, which made the OMNI 50s performance especially impressive. DSOM turned out to be an excellent choice for showcasing the OMNI 50s particular talents; they passed with flying colors. The OMNI 50s continued their exhibition of soundstage prowess with Carl Orffs Carmina Burana [EMI 66951], displaying an incredible ability to recreate the ambiance of a hall without the use of artificial DSP modes. The effect was as believable as with any other speakers I can recall hearing this music through, including many costing several times as much. True, the 50s gave up some ground when it came to absolute imaging and layering of voices, but that seemed a small price to pay. Transparency and detail were as good as anything else Ive heard at this price. This is an extremely dynamic recording that goes quickly from soft, intricate voices to loud orchestral outbursts -- the sort of thing at which many small monitors falter. The OMNI 50 was able to handle both extremes with equal aplomb. I then dropped Blue Man Groups The Complex [Lava 83631-2] in for a spin. The OMNI 50s displayed accurate imaging on "Shadows, Part 2," some of the techno sound effects traveling seamlessly between and well beyond the speakers and proving that the 50s could do some pretty interesting things with the soundstage. On such tracks as "The Complex," I thought the Mirages pretty well held their own with bass output, but on other cuts, particularly the delightfully different cover of Jefferson Airplanes "White Rabbit," they fairly cried out for a subwoofer. Still, what bass there was sounded exceptionally quick, clean, and well-defined. On the other end of the pop/rock spectrum from Blue Man Group is Chantal Kreviazuks What If It All Means Something [Columbia 86482], and the crystalline chimes that seem to come from everywhere at the opening of "Miss April" are a perfect example. The OMNIs displayed the same finesse and detail as with Blue Man Group and Pink Floyd -- I felt as if I could reach out and touch the chimes, if only theyd stay put for a second or two. The piano sounded perfectly natural, and Kreviazuks voice was locked perfectly in the center in the comparatively minimalist "Turn the Page." Finally, turning to jazz, I laid on a little Holly Cole Trio, in the form of Temptation [Blue Note 31653]. Reviewing my notes from listening to the Blue Man Group CD, I immediately skipped to "Train Song," assuming it would verify the lack of bass Id heard earlier. Instead, I heard rich, full, deep, powerful bass that belied the OMNI 50s small size. The bass didnt have quite the depth and punch it would have had with a subwoofer switched in, but in this case it was sufficient. The 50s also produced surprising richness and warmth on such cuts as "Falling Down." Id expected them to sound a touch thin with Temptation; they were anything but. I had the floorstanding Paradigm Esprit v.3s on hand during the course of this review; at $400/pair, theyre close competition for the OMNI 50s. However, in sharp contrast to the Mirage, the Esprit is a more conventional speaker with a front-firing woofer and tweeter. 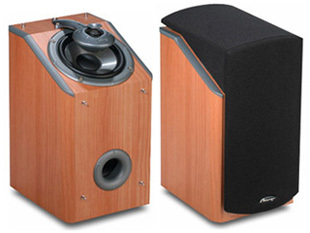 Both designs are very successful in different ways, and constitute a fascinating study in contrasting goals in speaker design. The Paradigm strives to be a good all-around performer with an extended and flat frequency response from the mid-30Hz range all the way up to 20kHz. Mirage is willing to give up some extreme low frequencies and imaging in order to provide a larger, more open soundstage. The Paradigms had a more even frequency response and tighter imaging in both of my listening rooms; the Mirages gave a little ground in these areas, but opened up the soundstage to a degree that the Paradigms couldnt match. Both designs performed well in terms of detail, though the Mirages inner detail and clarity in the upper frequencies were slightly better than the Paradigms. The OMNI 50 was also slightly on the bright side of neutral in my listening room, while the Esprit was just about dead neutral. While choosing between these two speakers would of course boil down to priorities, the OMNIs soundstage was seductive and, providing I had a subwoofer on hand, would be hard to turn down. The Mirage OMNI 50 proved to be an amazing performer; it will be sorely missed around here. There are few enough speakers on the market that can carpet a room with a wall-to-wall soundstage as the OMNIs did, and fewer still that do it for this kind of money. While not nearly as difficult to position as my old dipoles were, they do require a little care. That said, the Mirage OMNI 50 is one of the best speaker values Ive come across in the sub-$1000 price class.